Sun Barrier Products now offers Crimsafe®, the newest innovation in security, hurricane	protection and energy efficiency. Crimsafe® is a stainless steel security	mesh and frame system. Crimsafe® can be used to secure doors, windows,	lanais and balconies. From a distance, it looks like an insect screen. And it does the same job	of allowing cool breezes to pass through, while keeping insects out. But	Crimsafe® is unlike any other insect screen you’ve ever seen,	because it makes your home virtually impenetrable to thieves and hurricanes. Since Crimsafe® is a mesh, it allows light and visibility, even during	a hurricane. The Crimsafe® mesh is sandwiched between two serrated pieces of aluminum	that clamp the mesh tight. One is an aluminum strip with a hook and the	other is the frame that the strip hooks into. But then, all three are	screwed together with stainless steel tamper-resistant screws and the	different components are separated by a Santoprene (rubber) bead to eliminate	electrolysis that could lead to corrosion. This combination mechanically	fastens the mesh to the frame and creates a solid, secure barrier that	is tested for security, hurricane force windows and wind-borne debris	(large missile impact). This system is internationally patented and unique. Only Crimsafe®	features screws driven through both the clamp and the mesh and right into	the frame on the other side, providing incredible strength. Crimsafe® has more to offer Florida homeowners than security and storm	protection. Crimsafe® also offers 55% Solar Heat Gain Coefficient	(SHGC). Adding Crimsafe® screens on your windows and doors can greatly	reduce the amount of heat entering your home, therefore reducing the need	to run the air-conditioning and thus reducing your energy costs. The energy	efficient qualities of Crimsafe® allows the product to qualify under	the Solar Rights Law. Crimsafe® is available in fixed units and Safe-S-Cape hinged units	that allow for easy opening of the screens from the interior, for covering	egress windows. Crimsafe® can also be used as a balcony enclosure to replace intrusive	railings, allowing airflow and maximum visibility. Crimsafe® Operable	Sliding Screens are designed to cover your existing sliding glass doors,	have the appearance of a regular screen, but offers security and insect	control, while still offering the ventilation of a screen. Crimsafe® also offers Storm Doors that beautifully covers your front	door while offering 24/7 security and storm protection, even when your	entry door is open. 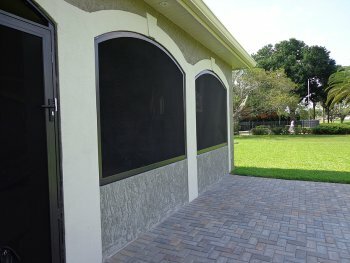 Sun Barrier Products, Inc. offers two different types of Roll Shutters, the ShutterSystem double-wall	shutter and the Nightbarrier single-wall shutter. Both types are engineered	and approved for Hurricane Protection, and also offer Security, Sun control	and Insulation. Both types of shutters are state of the art extruded aluminum	with a powder coat finish. Roll Shutters are the ideal exterior storm	and security solution for residential, storefront, commercial, mid-rise	and even high-rise applications. Windows, sliding glass doors, lanais	and business storefronts are protected behind a solid, secure extruded	aluminum barrier. ShutterSystem double-wall Roll Shutters are manufactured from extruded	aluminum and are available in both non retention and retention tracks	so that wide openings can be covered without the need for storm bars. The double-walled slat provides hurricane protection, security and insulation. The slats have the option of vent holes that can allow light and air to	come in when the shutters are partially closed. When the shutters are	closed and locked, the vent holes are covered to provide a solid, secure barrier. Nightbarrier Shutters are state of the art end-retention shutters featuring	the most compact housing sizes in the Roll Shutter product line. The size	of the housing will no longer detract from the appearance of a home or	business. Home and business owners alike can now utilize these aluminum	shutters, where previously the space available would not accommodate roll shutters. Ease of use and incredible strength makes the Nightbarrier Shutter a great	choice for Roll Shutters in both commercial and residential applications. A series of forced entry tests are performed for security protection. When the roll shutters are closed, the bottom rail locks securely into	the side track. Specialty security keylocks and keys can be added to the	bottom rail to allow for exterior operation of the roll shutters and secure	snap covers are utilized to conceal all fastening hardware. How Are Roll Shutters Operated? Motorization: Motorized shutters operate with a dedicated remote control; offering simple	and convenient operation. A manual crank handle can be provided to offer	a means of egress in case of power failure. Sun Barrier Products offers	a full line of technologically advanced motorized shutter controls such	as individual/group control, timer switch, wind-rain sensor, and can interface	with Smart House controls and Smart Phones. Motors are offered at a number	of price points and all include a 5-year manufactures warranty. With consistent	care and correct operation, you can expect your motor to last well beyond	the 5-year warranty. Manual Operation: ShutterSystem Roll Shutters can be outfitted with an interior gear, crank	and handle assembly that allows operation with a simple cranking motion. The gears are spring loaded; allowing a heavy aluminum shutter to be operated	with relative ease. Nightbarrier Shutters can be manually operated by	a counter-balance system, even in large openings, by simply pulling the	shutter up or down by hand. Security keyed locks are necessary with the	hand operated counter-balance system. Commercial Applications: The Nightbarrier Roll Down Shutter is the perfect solution for commercial	applications. Storefronts are secure behind the heavy-duty extruded aluminum	curtain. Quick-release latches or keylocks provide fast and easy entry. Installation of Nightbarrier for Countertop Security provides a shutter	that is aesthetically pleasing and secure. Unlike traditional steel countertop	shutters, the extruded aluminum will not rust or corrode. The baked-on	powder coat finish adds a beautiful look to ultimate security. Accordion shutters are manufactured by Sun Barrier Products, Inc. from	T-6063 extruded aluminum with an electrostatically applied baked-on finish. Accordion shutters are designed to be permanently installed on your home,	so they can be closed and locked quickly when severe weather protection	or security is needed. Unlike storm panels, there is nothing to store	away. Accordion shutters have interlocking blades fit into a top header	and bottom sill, and glide easily on stainless steel wheel carriages with	heavy-duty nylon wheels. When not in use, Accordions stack compactly at	each side of the opening. Hurricane and Security Protection:Accordion Shutters are tested and approved for Hurricane protection, including windload and large missile impact. They are also perfect for	security, because of their quality construction, ease of operation, and	locking system. Accordions can be installed on doors, windows and balconies	and lanais. When protecting your home, enclosing the lanai is a more secure	design than covering individual openings under the lanai, by preventing	pressure building up under the roof of the lanai. Homeowners also have	the convenience of storing all their patio furniture, grills, etc., inside	the lanai. Accordion Shutters are also available with the option to add blades with	clear Lexan windows to provide light and visibility when the shutters	are closed. Contact Central Florida’s premier Shutter Company, Sun Barrier Products, Inc.,	to see how we can help with your shutter installation today. Come visit	our showroom and manufacturing plant.